Home / MOVIE TRAILERS AND INFO / "My Cactus Heart" Movie Trailer, Cast, and Information! "My Cactus Heart" Movie Trailer, Cast, and Information! "My Cactus Heart" also known as "#MyCactusHeart" is the first-ever romantic-comedy movie offering of Star Cinema that is topbilled by the country's most exciting stars of this generation, Matteo Guidicelli, Xian Lim, and Maja Salvador. Finally, Star Cinema has given the chance for Maja Salvador to shine as the lead role in a romantic-comedy film that everyone will surely relate to. Real-life boyfriend, Matteo Guidicelli agrees to pair in this movie. They look cute on the big screen together. Love is such a “thorny” issue! If the one you love believes in that, can there still be a happy ending? "My Cactus Heart" is about a girl named Sandy who comes from a broken family. She doesn't believe in happily ever after. She believes that love only hurts that is why is known as the girl who always broke the heart of her suitors. But what if someone comes along and will make her question what she believes in? What will she do? Can that someone change her jaded heart? Maja Salvador is known as one of the most talented actresses of her generation. She can do drama, horror, comedy, action, and romance. In "My Cactus Heart", Maja Salvador showed her best talent. Star Cinema movie outfit has given Maja this opportunity to star in her own romantic-comedy movie because they believe in her talent as an artist and she can do any role, professionally, and at her best! “My Cactus Heart” is directed by Enrico Santos, the movie opens nationwide in over 100 theaters on January 25, 2012. Below is the movie trailer of "My Cactus Heart". 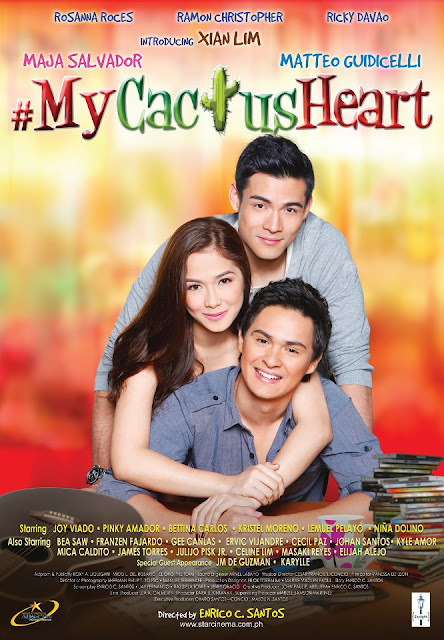 Follow movie news on twitter @movienewsdotme for more information on hashtag #MyCactusHeart.